Wild Organics - How Does Wild Work? When can I place an order and when does Wild deliver? How do collection points work? 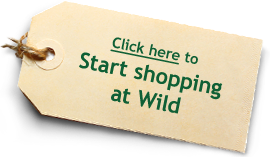 Can I become a regular weekly customer… without having to re-order my Wild Bag by Saturday every week? What if I’m late in ordering, can I still receive a Wild Bag? When is the latest I can change or cancel my order? If I sign up, do I have to receive a bag every week? Can I add produce to my Standard Bag order? What if I don't like the contents of the Standard Bag? Sometimes I receive produce that I was not expecting ….? I think something is missing from my order...? Should I wash my Wild veg? What about storing Wild veg to make it last? Is all your produce local? It starts with Registering to become a Wild customer. Once registered hereafter, just Log-In, using your email address and your password. Once that's done you can start with your order … decide which Wild Bag best meets your needs, add any extras you require, or create your own Wild Made-to-Order Bag, follow the route to "Checkout". Any changes to orders or cancellations we needs to be mailed info@wildorganics.co.za before our office closes at 1pm Saturday. A minimum rand value of R130 is required to place an order. Do keep our weekly cycle in mind ... Wild and our farmers need a bit of time to process your order! Our website opens for orders from 6pm Wednesday evening through to 8am Sunday morning. Choose to subscribe to our newsletter and receive an email each Wednesday letting you know what will be in our Wild Bags the following week. What are the delivery arrangements? We have Collection Points to select from throughout the City of Cape Town Metro. All orders must be collected on the day of delivery. Neither Wild nor our Collection Points will be held responsible for orders not collected on the day of delivery. We send a reminder sms once your order is ready for collection at your chosen Collection Point. If you have an order that includes dairy or meat produce, we suggest a home or office delivery. A delivery fee of R75 will be charged. There are a few suburbs that we do not deliver to, please contact us to confirm. You will recieve a reminder sms when your order is ready for collection. When collecting please ask to sign the `Collection Point Sheet`. Here we make a note of how many bags / boxes to expect and what cold items eg dairy & meat you will find in the cooler bag / box for you to collect. Orders need to be collected on day of delivery. Become a regular weekly customer for a Wild Standard Bag? Contact us via email, requesting to be a regular weekly … or fortnightly … customer. We will repeat your order for a Standard or Mini bag. The only time you’ll need to contact us is when your order needs to be placed on hold. Please email us at info@wildorganics.co.za no later than midday on the Saturday prior to that Wednesday's delivery. Late notifications will de delivered and billed. This option only applies for a Standard or Mini bag - NO extra produce included. To make it easier, arrange a regular weekly or monthly payment instruction with your bank. Please contact us to find out if we have a spare Standard bag available via email or call our office on 021 510 5447 or 084 448 1020. Shortly after placing your order, you and Wild will receive in your inbox an `Order Confirmation` with our banking details on the provisional invoice. Payment for orders is required before or in the week of delivery of each order. You can CHANGE or CANCEL your order by emailing info@wildorganics.co.za before 1pm Saturday. Cancellations received after Saturday midday are tricky as we process & place your order with our farmers. Late cancellations will be charged. Of course not! Our customers need to experiment with what works for them. It takes time to adjust to eating locally and seasonally and to decide how much you need. You can order a Wild Bag whenever you want and you can change your Wild-Made-to-Order Bag each week. You can add anything to your Wild bag order. Scroll through the list to see what else is currently on our shelves and add it to your shopping basket. If what’s in a Wild bag doesn’t excite you, consider making your own Wild Made-to-order bag for that week. Please remember Organic Farming is not predictable. It can be that despite the farmer’s best efforts and our best intentions, we do not receive exactly what we order so it can happen that we do have to change some items in our Wild Standard or Mini Bag at the last minute. The upsides is that it helps people get creative with what the harvest provides. Occasionally we have to make a change to your Standard or Mini bag contents because of the weather or yields. First check that we haven’t substituted an item for something else. But if something is missing, please let us know within 24 hours and we’ll replace it with your next delivery. While every attempt is made to source and gently pack the best quality organic produce we can find, it can happen that produce is very ripe and is bruised or damaged on route to your home. Please do contact us within 24 hours of delivery if you are unhappy with your produce and we will make a note to replace them the following week or, if we are not able to source quality produce, we will pass a credit to your account. Absolutely. Our produce is farmed organically without the use of synthetic fertilisers, herbicides or pesticides. All our farmers treat livestock ethically, meeting the physiological and behavioural needs of their animals. They farm without using hormones and routine antibiotics. We insist that animals are given plenty of space and fresh air to thrive and grow - guaranteeing a humane, proper free range life. As far as possible, our produce is sourced locally, cutting down on packaging, storage and transport. It is our priority to support and grow the base of farmers who have made the commendable decision to farm organically. Most of our produce is certified, but it can be that we choose to support a farmer who is either in conversion or is too small to afford certification. If they’re in conversion, or can’t afford certification, we at least know that they’re farming the right way– and that’s what matters. All our products are made or packed in factories that use nuts, glutens, dairy and other natural allergens. Yes, please do. We aim to give you great tasting, ethically produced food without impacting on the environment. We try to avoid mechanical washing of our vegetables as it can damage them, reducing shelf life, nutritional content and flavour. Fruit and veg should be washed as close to eating as possible. Our philosophy on packaging is also simple - use as little as possible without compromising quality. The real trick is to receive it and pack it away as soon as you possibly can. Consider each item, wash if necessary and store it as it should be stored … in a cool, dry place, in a glass bottle, in newspaper or in sandwich wrap in the fridge. Please contact us if you have any questions about any of our produce. 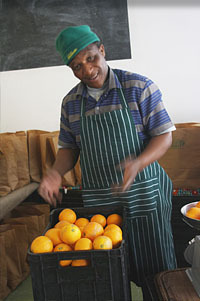 We work hard at making sure that as much of our produce as possible is from the Cape. We do get small quantities of fruit and meat from elsewhere in South Africa. It is very difficult to source organic dried produce locally, so some of our grains, legumes, rice and seeds are imported. Please note: our online shop is open each Wednesday at 18h00 and closes on Saturday at 17h00.